During the 3rd Silesian Science Festival KATOWICE we had a very special guest in Katowice – Johannes Georg Bednorz. Born May 16, 1950, J.G. Bednorz is German mineralogist and physicist and Nobel Laureate in the field of Physics. For the discovery of the phenomenon of high-temperature superconductivity in ceramic materials, Bednorz has received a number of scientific prizes, most notably the esteemed Nobel Prize in the field of physics in 1987. 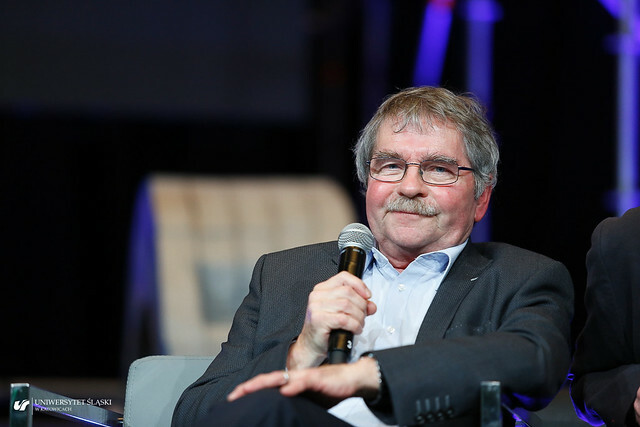 Bednorz has obtained his PhD at Swiss Federal Institute of Technology in Zurich in 1982 and is related to IBM since then (currently being appointed an IBM Fellow). Continuing his research on condensed matter physics, he still remains an active scientist. In course of the 3rd Silesian Science Festival KATOWICE Bednorz presented a lecture: Superconductivity. From a Physics Phenomenon to the Key Technology of the 21st Century and had his own author’s meeting at the main stage of the Festival, where he presented insights in his researches and scientific achievements. Bednorz also had a guest lecture for students at the Silesian Centre for Education and Interdisciplinary Research – an advanced research unit of the University of Silesia. The visit is even more special for the University since in April 2007 J.G. Bednorz was awarded an honorary doctorate degree at the University of Silesia. This placed Bednorz among the elite of scientists most acclaimed by the University of Silesia.